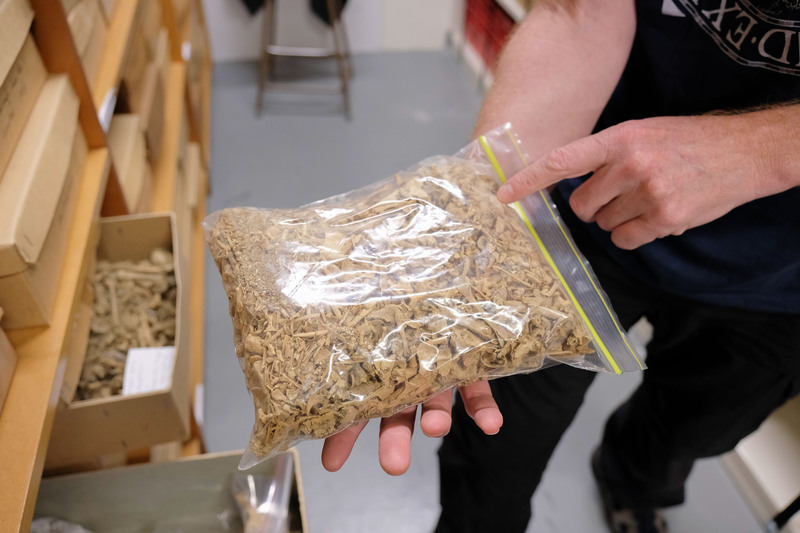 For over 100 years, enthusiasts and scientists have collected perhaps 1,000 individual birds and reptiles from this cave, known scientifically as a pitfall trap, which are now in Te Papa’s collections. 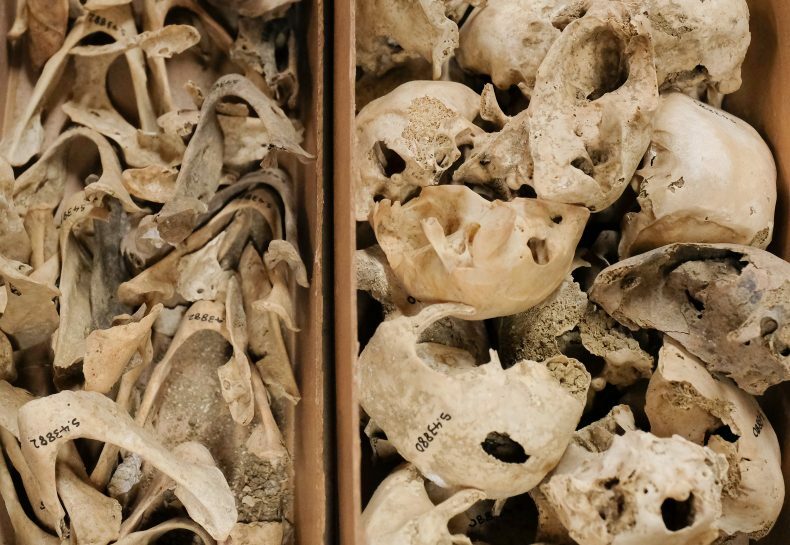 There are so many specimens that only around half have been registered and thousands still lie untouched in the dark cave. 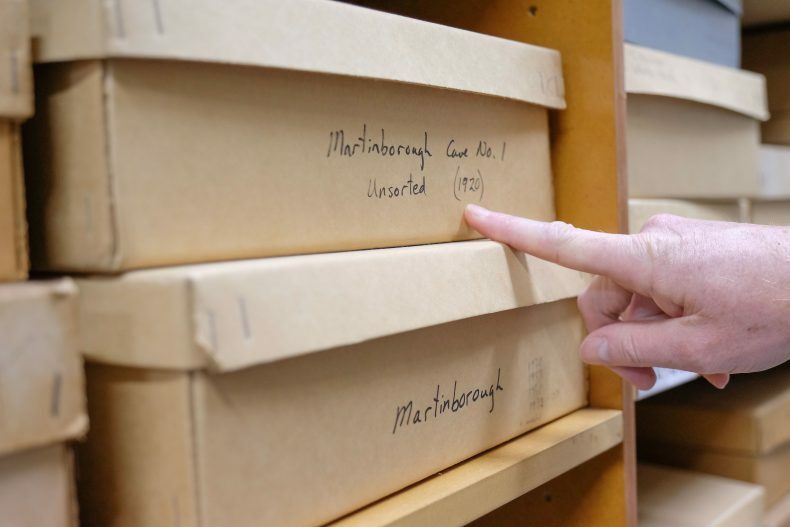 Thousands of years ago the Martinborough area wasn’t the heavily farmed vineyard landscape we know today. It was covered in thick forest perfect for ground dwelling flightless birds and reptiles to roam. 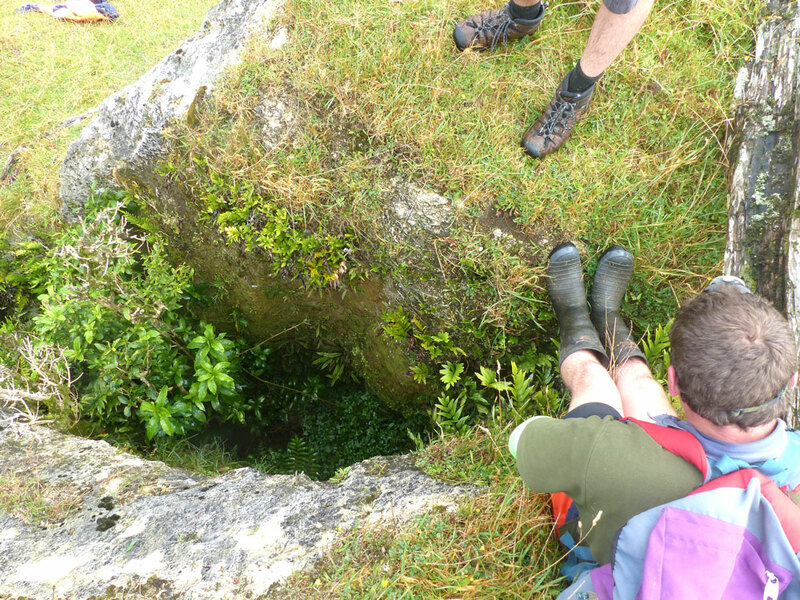 Much of the land near Martinborough is underlain by limestone and this rocky landscape creates many hidden holes. The thick vegetation at the time would have concealed these and our flightless birds had very little chance of making it out alive once they fell in. The pitfall trap was first found by a deer hunter in 1914. 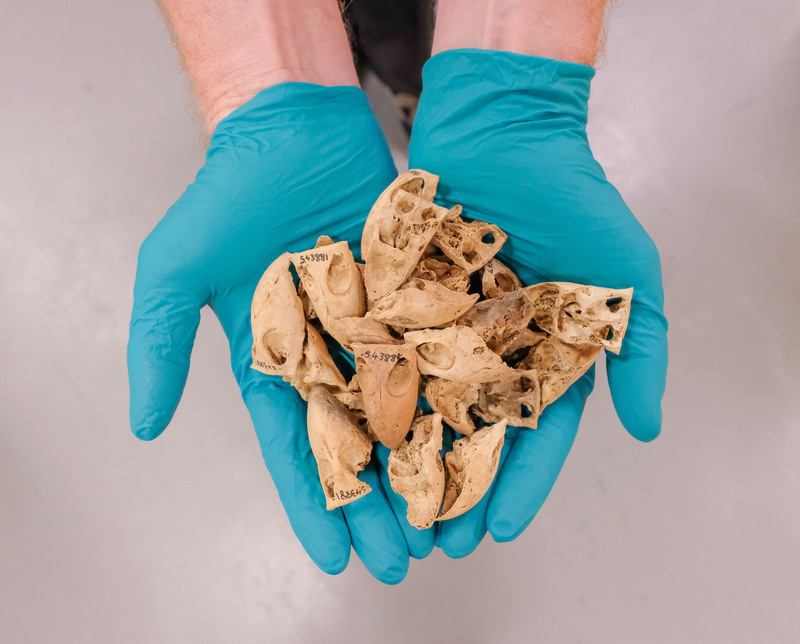 Since then, Te Papa and its forerunner the Dominion Museum, have mounted several expeditions to the cave, excavating several tonnes of earth and bones. The first expedition took place in 1920, and the most recent expedition in March 2017 included our vertebrate curator Alan Tennyson. 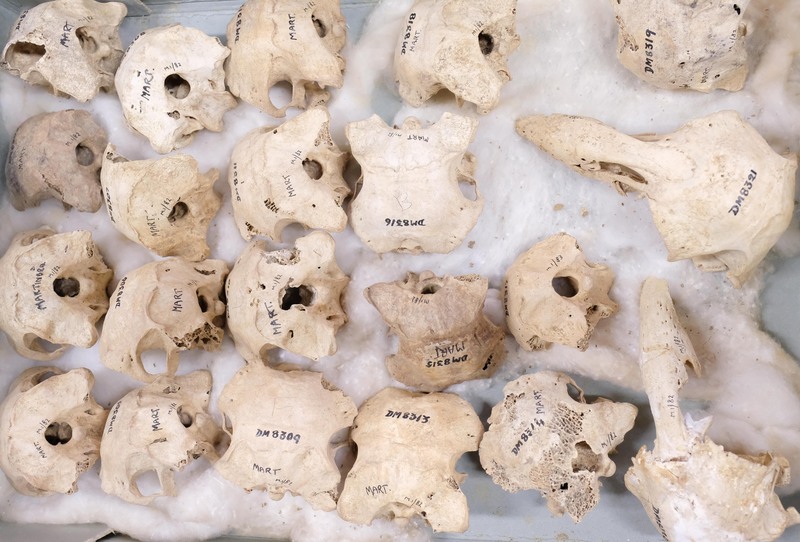 Because of the huge amount of material collected only about half of the bones have been sorted into individual specimens. So far, among the larger birds, 80 kakapo, 7 North Island takahe, 25 moa, 30 kiwi, 90 Finsch’s duck, 11 weka and 22 adzebills have been identified. 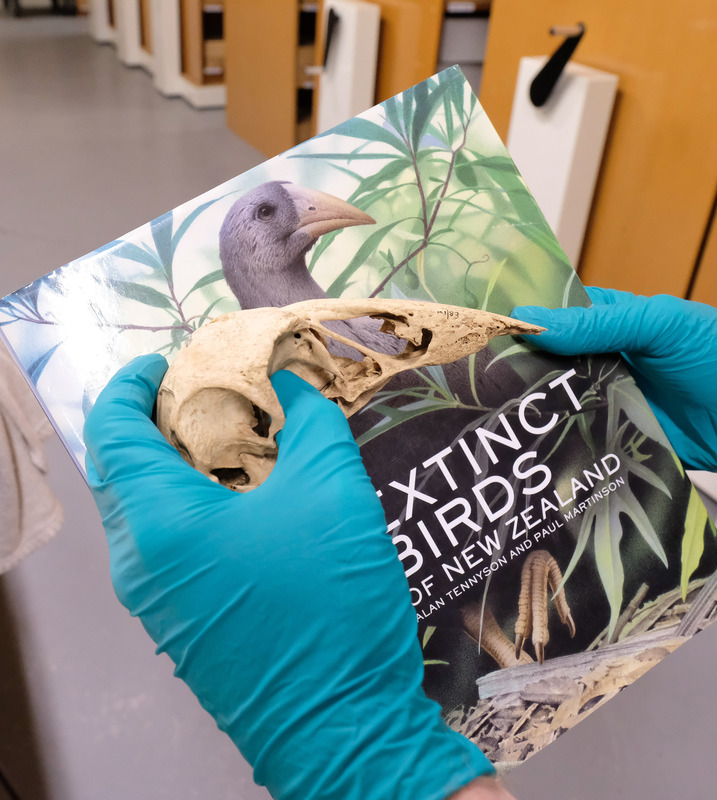 The sheer number of specimens identified from the cave give a good idea of how common birds such as the kakapo and adzebills were in the Martinborough region. 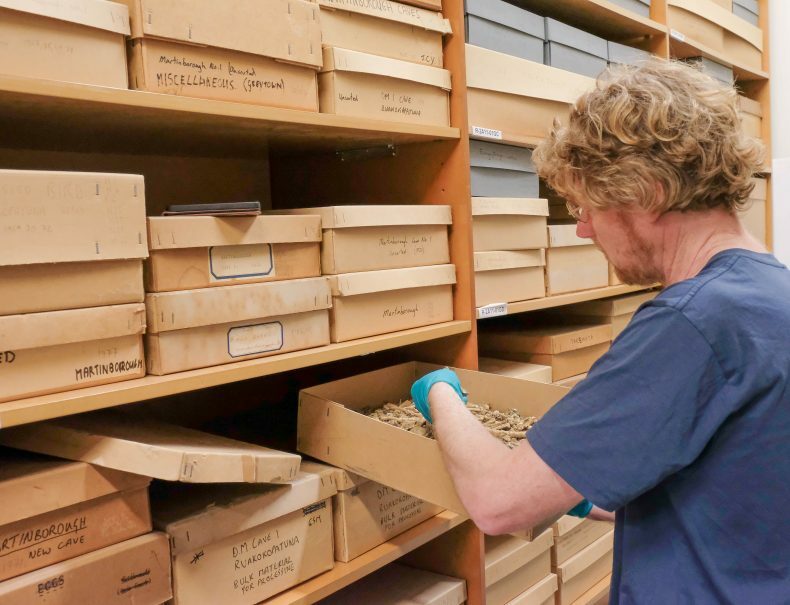 We’d like to thank Luke and Clint Easton who’ve generously donated many fossils from the Martinborough cave over the recent years and organised Alan’s expedition to the cave in March 2017. Wow a few of us were just chatting about the caves on the family farm in Martinborough and intrigued on what could be found. Likewise, my uncle, who along with my mother, grew up in Featherstone, took us to a cave somewhere on the way to Martinborough or Lake Wairarapa in the 1970’s I think. It was a horizontal one I recall. Yes there are quite a few caves in that limestone country! From the look of the sinkhole I suspect this is what we knew as Harrison’s Hole. The late RK Dell, who was at one stage the Director of Dominion Museum, described a subfossil snail (Rhytida yaldwyni) from this site. It was later shown to be a subfossil Wainuia urnula, a snail species which is commonly found in the Wellington area. My friend John Marston and I spent several days at the bottom of this sinkhole in 1966 looking for snails and in the process excavating a lot of bird bones. Most of these bones were sent to Ron Scarlett at Canterbury Museum. Interesting to see the log at the edge of the photo where we tied a rope to lower ourselves into the sinkhole. Our first challenge was to remove the layer of sheep and cattle remains. Good memory Ian – indeed this is Martinborough No 1 as known in 1901, and Harrisons Hole and some other name. 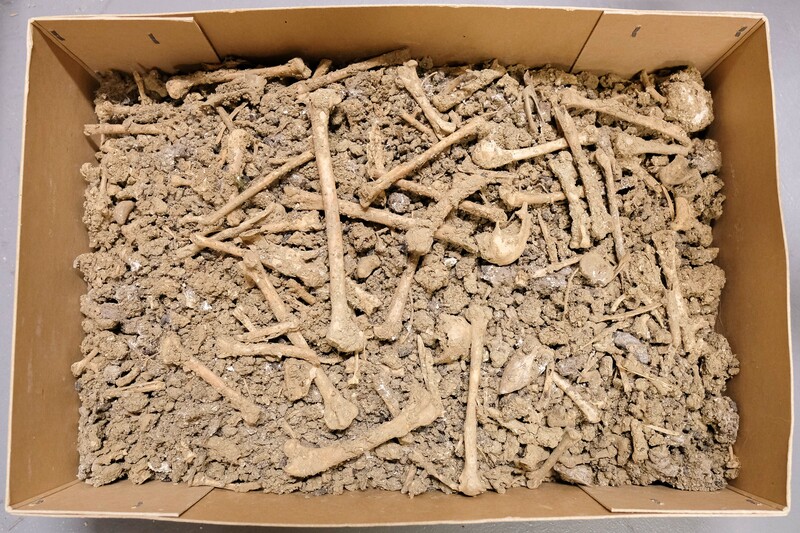 Many specimens have been radiocarbon dated from this site including series of finschs duck and some moa. Harrisons after Bob Harrison? who still had some Moa toe bones. It’s interesting to hear your recollections Ian. If you send me an email (alant@tepapa.govt.nz), I’d like to get a few more details of your trip(s). It seems that the cave was named after Walter Harrison – the deerstalker who ‘found’ the cave. 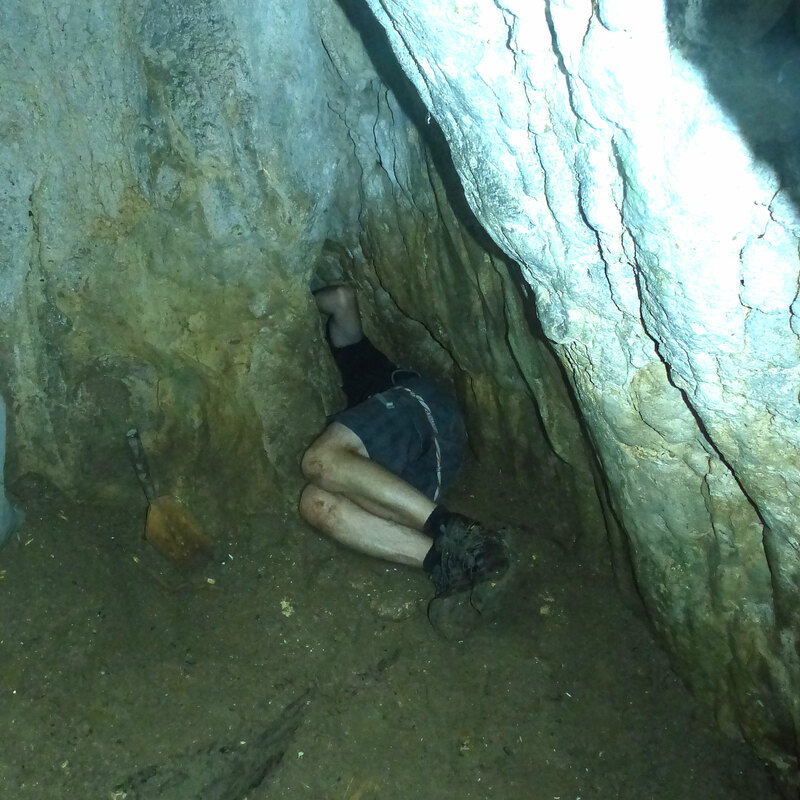 Thanks – yes, there are still many unexplored caves & crevices in NZ that may hold similar treasures. Fascinating. When I was a child my father took us to a cave near Martinborough to see bats. We had to wade through ongaonga. Very painful. What sort of bats – maybe long tail? That’s really interesting. Both long-tailed & short-tailed bats still occur – but only rarely – in the Wairarapa, so I’m not sure which species you would have seen. 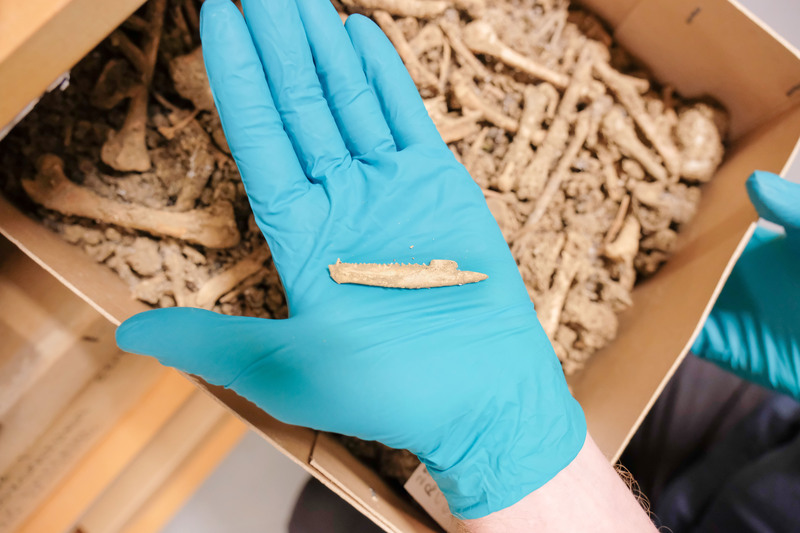 Perhaps they were more likely to have been long-taileds in caves on farmland? I don’t think that there are any bats left close to Martinborough now. Fascinating numbers, Alan. Ducks are dumb, OK; but Kakapo? They must have been thick on the ground, or are they not as bright as other parrots? The bird bones may have accumulated there over 1000s of years, but even so, there are a lot of kakapo down there. My guess is that kakapo were once quite abundant in the area. Love the ‘collecting samples’ photograph. It looks horribly difficult. A picture says a thousand words…. Yes, it’s quite muddy & a bit smelly down there!